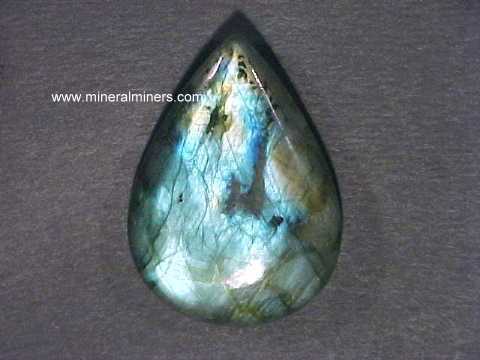 Try our Polished Labradorite Satisfaction Guarantee - compare our prices and our superior quality. 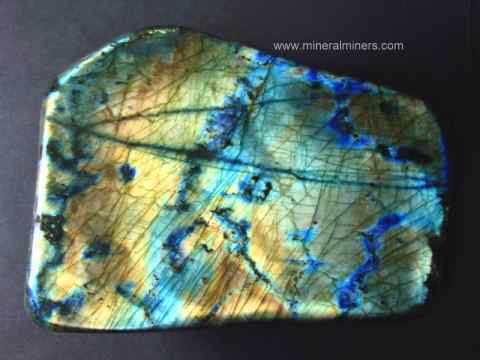 Click on any handcrafted polished labradorite specimen image below to enlarge it. Labradorite Specimen Dimensions: 4.8" x 3.5" x 2"
This beautiful specimen of natural color labradorite feldspar (also known as spectrolite) has large colorful areas of jewelry grade on its front surface. It has been roughly hand-ground and polished on all surfaces to better show its rich "color-play" (also known as labradorescence or schiller) that flashes out at different angles as you turn it in shades of blue, green, and gold with a small amount of purple-pink also! Polished Labradorite Dimensions: 7" x 3.3" x 1.7"
This beautiful specimen of natural color labradorite feldspar (also known as spectrolite) has large colorful areas on its front and back surfaces. 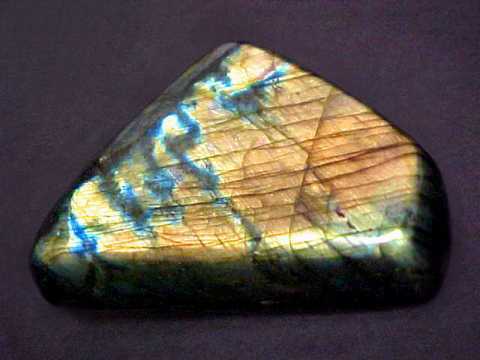 This unique labradorite specimen has been roughly hand-ground and then hand-polished on all surfaces to better show its rich "color-play" (also known as labradorescence or schiller) that flashes out at different angles as you turn it in shades of green, blue and gold. 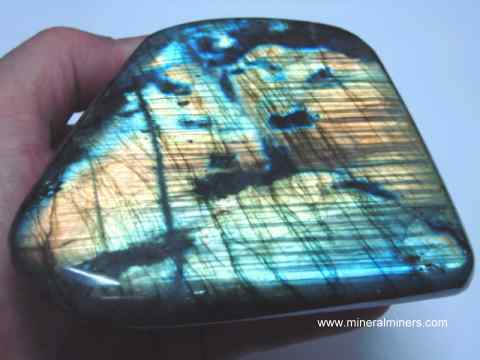 See also an opposite side view of this polished labradorite specimen. Polished Labradorite Dimensions: 5.7" x 3.7" x 2.4"
This superior quality specimen of natural color labradorite feldspar (also known as spectrolite) has large colorful areas of fine jewelry quality on its front surface. It has been roughly hand-ground and polished on all surfaces to better show its rich "color-play" (also known as labradorescence or schiller) that flashes out at different angles as you turn it in beautiful shades of golden-green and blue. Labradorite Specimen Dimensions: 6.4" x 5.5" x 3.0"
This beautiful specimen of natural color labradorite feldspar (also known as spectrolite) has large colorful areas of jewelry grade on its front surface. It has been roughly hand-ground and polished on all surfaces to better show its rich "color-play" (also known as labradorescence or schiller) that flashes out at different angles as you turn it with gold and green colors as well as a small amount of blue and purple! This unique labradorite pendant was hand-crafted in 925 sterling silver and set with three cabochon gemstones of natural color labradorite with beautiful golden-green and blue flashes of natural iridescent color. At the top there is a 13x6mm marquis shape labradorite cabochon gem, in the middle a 7x5mm pear shape labradorite cabochon gem, and at the bottom a 6mm round labradorite cabochon. 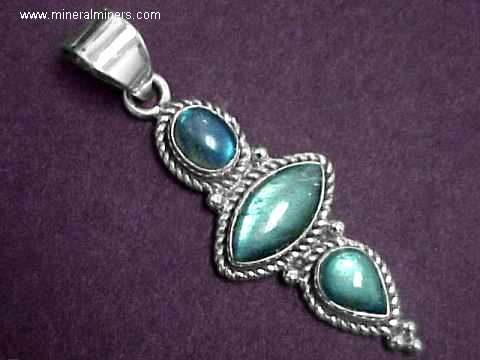 This lovely labradorite pendant was hand-crafted in 925 sterling silver and set with two gems of natural color labradorite with beautiful green and blue flashes of natural iridescent color. At the top this beautiful pendant is set with a 16x12mm pear shape cabochon gem of genuine labradorite, with a 7mm round faceted gem of genuine labradorite set down at the bottom of the pendant. This beautiful labradorite pendant was hand-crafted in sterling silver and set with three cabochon gemstones of natural labradorite with beautiful greenish-blue flashes of natural iridescent color, these natural labradorite gems measure from 9x7mm up to 16x8mm. Large Labradorite Pendant in Sterling Silver! This natural labradorite pendant was hand-crafted in sterling silver and set with four multi-shaped cabochon gemstones of natural labradorite measuring from 14x10mm up to 18x14mm. The natural gemstones in this genuine labradorite jewelry design have flashes of natural iridescent colors in beautiful hues of blue and golden-green. This beautiful labradorite ring was hand-crafted in sterling silver and set with a 14x10mm oval shaped cabochon gem of natural labradorite with blue-green flashes of iridescent natural color. See also a view of this natural labradorite ring from above. This heavy sterling silver ring was hand-crafted and set with a 16x12mm oval shaped cabochon gem of natural labradorite. This beautiful labradorite ring has rich blue flashes of iridescent color. 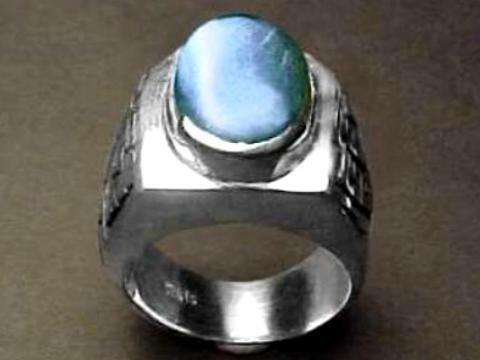 See also a side view photo of this genuine labradorite ring. This genuine labradorite necklace was hand-crafted from natural labradorite of superior quality (also known as spectrolite). This high quality labradorite is semi-transparent to transparent with occasional blue, green & gold flashes of beautiful iridescent natural color. The labradorite was hand-ground and polished into drop shaped beads which were then drilled and strung in this lovely 18" labradorite necklace with a sterling silver clasp. The photo at left shows a close-up view. See also a full view of this natural labradorite bead necklace. This large labradorite jewelry pendant was hand-crafted in sterling silver and set with three gemstones of natural labradorite measuring from 6mm in diameter up to 13x7mm. These genuine labradorite gems have beautiful greenish-blue and golden flashes of natural iridescent color. This natural labradorite necklace was hand-crafted from very high-grade quality natural labradorite (also known as spectrolite). The beads in this rare quality labradorite necklace are semi-transparent to transparent with occasional blue, green & gold flashes of beautiful iridescent natural color. The labradorite was hand-ground and polished into round shaped beads which were then drilled and strung in this lovely 18" labradorite necklace with a sterling silver clasp. The photo at left shows a close-up view. See also a full view of this natural labradorite necklace. We have this round bead labradorite necklace available with 5.5mm diameter beads, and also in a much larger 7mm bead diameter size. Please see below to order. This rare quality labradorite bead necklace was hand-crafted from a very high-grade quality of natural labradorite (also known as spectrolite) which is actually transparent! 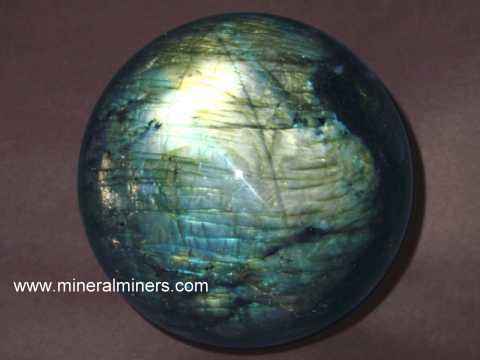 This natural labradorite has occasional blue, green & gold flashes of beautiful iridescent natural color. The labradorite was hand-ground and polished into tire shaped beads which were then drilled and strung into this 18" long labradorite necklace with a sterling silver clasp. The photo at left shows a close-up view. See also a full view of this natural labradorite necklace of tire shaped beads. 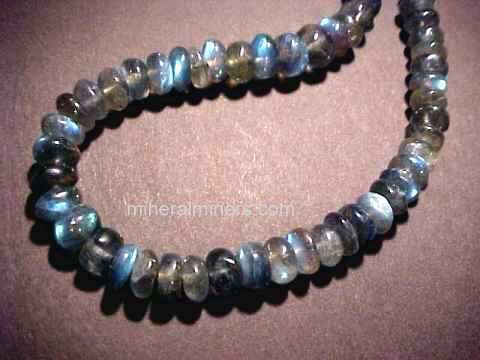 We have this labradorite necklace available in two bead diameter sizes: 4.5mm and 5.5mm, please see below to order. Labradorite Necklace with Disk Shape Beads, 18"
This beautiful labradorite bead necklace was hand-crafted from a very high-grade quality of natural labradorite (also known as spectrolite) which is actually semi-transparent to transparent! 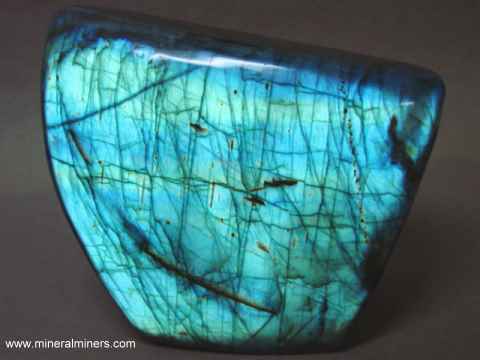 This rare quality labradorite has occasional blue, green & gold flashes of beautiful iridescent color. The labradorite was ground and polished into disk shaped beads which were then drilled and strung in this 18" long labradorite necklace with a sterling silver clasp. The photo at left shows a close-up view. See also a full view of this genuine labradorite necklace. 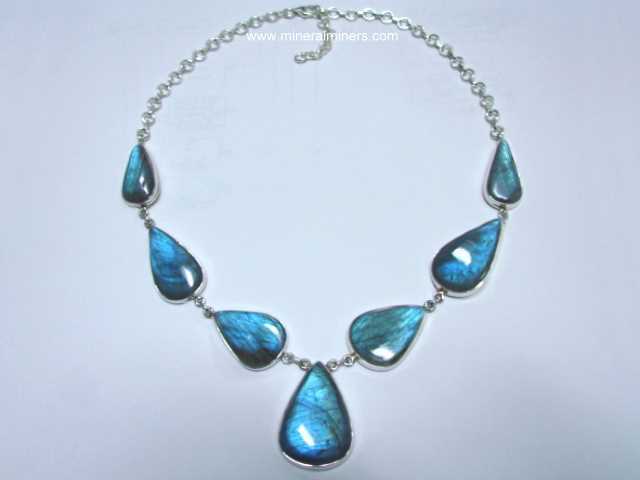 We have this labradorite necklace available in two bead diameter sizes: 8mm and 9mm, please see below to order. Superior quality labradorite pieces mined in Madagascar were tumbled and polished in baroque shapes, and then drilled and strung in this 18" (45cm) long labradorite necklace with a sterling silver clasp. These labradorite beads are semi-transparent to transparent, with beautiful flashes of gold, green and blue! There are approximately 180 drilled baroque beads in each of these genuine labradorite necklaces. The photo at left shows a close-up view. 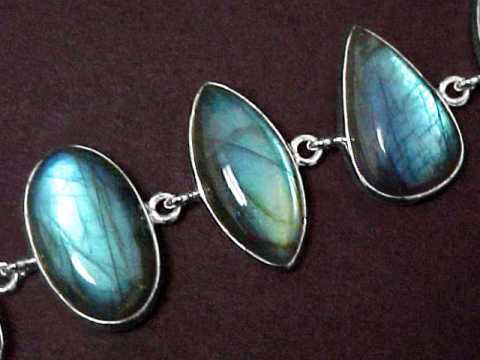 See also a full view of this genuine labradorite necklace. Natural labradorite pieces from Madagascar with beautiful flashes of blues, greens and golds were tumbled and polished in baroque shapes, and then drilled and strung into this 36 inch (90cm) "endless" labradorite necklace. There are approximately 320 drilled baroque beads in each of these natural labradorite necklaces. The photo at left shows a close-up view. See also a full view of this genuine labradorite necklace. These necklaces of baroque shaped labradorite beads make great gifts! We also have baroque bead necklaces in amethyst, apatite, green aventurine, carnelian, citrine, garnet, lapis lazuli, moonstone, peridot, rock crystal, rose quartz, smoky quartz, tanzanite, multi-color tourmaline and others. This is the end of our page displaying Labradorite Polished Pieces and Handcrafted Labradorite Gift Ideas. Our Labradorite Polished Pieces and Handcrafted Labradorite Gifts are all natural color labradorite! We also offer handcrafted gifts of several dozen other natural mineral varieties. Would you like us to inform you when we add on this page more natural labradorite polished decorator pieces? 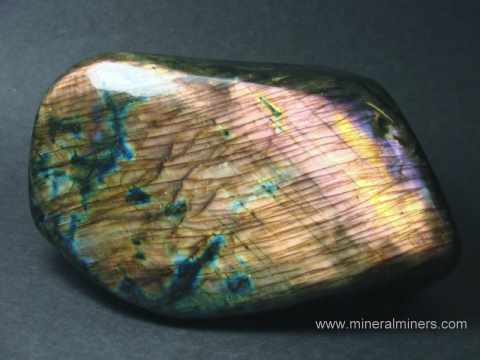 We do have additional inventory of natural color labradorite items in stock, so be sure to let us know if you have any special requests for genuine labradorite handcrafted & polished items. 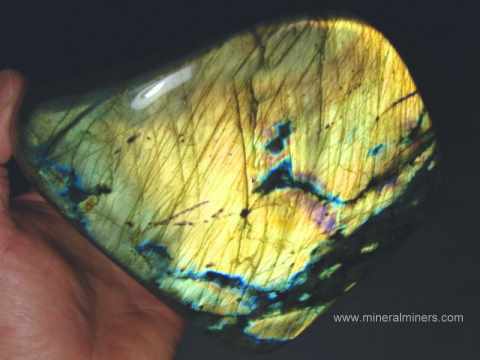 Please contact our webmaster, concerning genuine labradorite or our 'site' geologist with any questions or comments.